224 pages | 18 B/W Illus. Translation and Translanguaging brings into dialogue translanguaging as a theoretical lens and translation as an applied practice. This book is the first to ask, what can translanguaging tell us about translation and what can translation tell us about translanguaging? Translanguaging originated as a term to characterize bilingual and multilingual repertoires, and has been extended more recently to characterise the deployment of a spectra of semiotic resources including embodiment. This book extends the linguistic focus to consider translanguaging and translation in tandem – across languages, language varieties, registers, and discourses, and in a diverse range of contexts: everyday multilingual settings involving community interpreting and cultural brokering, embodied interaction in sports, text-based commodities, and multimodal experimental poetics. The book illustrates how perspectives from translation can enrich our understanding of translanguaging, and how translanguaging, with its notions of repertoire and the "moment", can contribute to a practice-based account of translation. Illustrated with examples from several languages, including Spanish, Chinese, Japanese, Czech, Lingala, and varieties of English, this timely book will be essential reading for researchers and graduate students in sociolinguistics, translation studies, multimodal studies, applied linguistics and related areas. 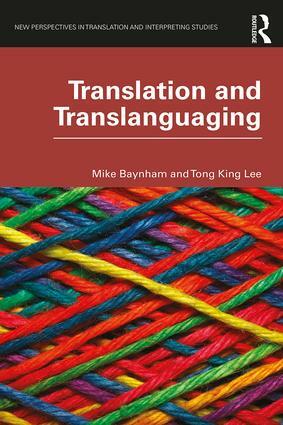 In this ground-breaking volume, Baynham and Lee revisit translation studies with the analytical insights from translanguaging. The result not only reinvigorates translation studies but also develops translanguaging to a new level. The range and variety of examples discussed in the book are breath-taking, making the book an exciting and rewarding read. Its impact will be enduring and far-reaching. Literature on translanguaging has expanded rapidly in recent years, but Mike Baynham and TK Lee take our understanding of the phenomenon in unexpected new directions. Drawing on a rich and varied corpus of examples, they consider the numerous intersections connecting translanguaging practices with the dynamics of translation. The result is a searching disruption of conventional definitions of translation but also a reflection on the creative potential of translanguaging itself. Essential reading for all those interested in researching across languages and cultures. Charles Forsdick, James Barrow Professor of French, University of Liverpool, AHRC Theme Leadership Fellow, Translating Cultures. 9 Concluding dialogue: What have we learnt? Mike Baynham is Emeritus Professor of TESOL at the University of Leeds and a Fellow at the Academy of Social Sciences, UK. Tong King Lee is Associate Professor of Translation at the University of Hong Kong.